Our users have been asking for a better structured Setapp to help them explore apps easily and make choices quickly. So, we built exactly that. If history has taught us anything about revolutions it’s that you better not lose touch with the crowd. Even if your revolution is limited to Mac apps. Since here at MacPaw wee see Setapp as our biggest endeavor yet, ever since we launched it, we’ve kept our users in the loop to make sure this new way is the right one. Could it be that the paradox of choice we were trying to eliminate was still there, even though Setapp was a lean suite of only 65 apps? We thought we had it all figured out with 9 years on the Mac market and millions of users. However, after a couple of surveys and a few dozen face-to-face interviews, we learned this: a staggering 47% of Setapp users wanted the apps grouped and categorized. It would help them understand what every app was for and, therefore, make decisions more quickly. So, we’ve done exactly that. The new Setapp is no longer a folder — more like a catalogue you can flip through, still with full descriptions for apps you find interesting, but also with brief summaries to give you an idea of the app’s purpose right away. It’s like a snug little store, except you already own all the merchandise. 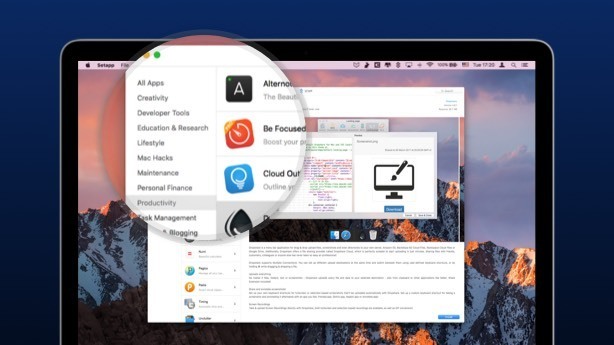 Apps are neatly organized now, into categories from Productivity and Lifestyle to Mac Hacks and Maintenance. There’s still an app for every job, but now you’ll find it faster. No need to open previews and read full descriptions to figure out what apps do. With one-line summaries like “The Duplicate Finder” you see it at a glance. Apps you’ve already installed are grouped into a separate category, so you can jump straight to the tools you already know and use. Now, in case you’ve grown accustomed to the Finder integration, we’ve got good news: as a current subscriber you can use Setapp the way you prefer, either as a folder in the Finder or a standalone app with categories. But if you’re all for new and better, just trash the Setapp folder and enjoy the revamped UI: your updated Setapp application can be opened from Launchpad. And those of you who are just about to subscribe? We’re a little jealous. You’ll start already with a better structured Setapp, built on massive amounts of feedback from other Mac geeks. So go ahead, take a look at how Setapp has evolved: the one thing that didn’t change is it’s free to try for a month.